Please note: This integration will be active for the entire Ottspott team. Once connected to Hubspot please go to the "Integrations" section in your profile & preference Hubspot user. Create our generate an Hubspot API Key . Please copy this API Key and keep it. Once connected to Ottspott, please go to the "Integrations" section. Paste your Hubspot API Keys in the appropriate field. Please click on the "Connect" button. 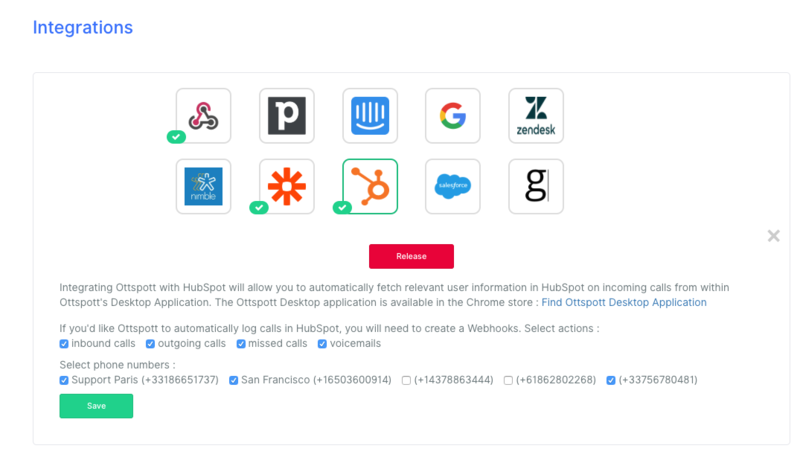 If you would like to log your calls inside Contact Hubspot Engagement, you will need to create a webhook. In the Ottspott backoffice, click on the expand button for the Hubspot Integration and tick each call action box and each Ottspott number you would like to log the activities in Hubspot. How does it look now with Hubspot? Now that the Ottspott desktop app is active, when you receive a call from a Hubspot contact, you will see in the Ottspott app all the information about the contact who is calling, just by clicking on the Hubspot logo. For each contact you can see an engagement when a call is placed, received, a voicemail or recording is left.